How might one demonstrate grade inflation? Grade curving: Example.”if you [the student] have a 72% average, but the class average is 52%, you [the student] are doing better than your score might suggest to you. Adding 20 to each number would make the class average a traditional 72% and give you [the student] a very respectable 92%.” (para 7). Grade inflation: Stuart Rojstaczer, later joined by Chris Healy conducted extensive research on grade inflation and found that “until the Vietnam War, C was the most common grade on college campuses (para 5, line #2)… By 1973, the GPA of an average student at a four-year college was 2.9. … By the mid-to-late 1990s, A was the most common grade at an average four-year college campus (and at a typical community college as well). 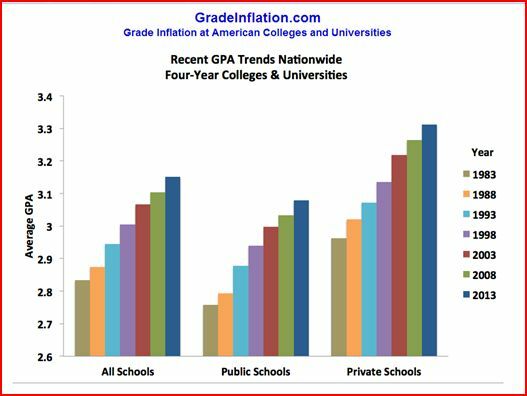 By 2013, the average college student had about a 3.15 GPA.” (para 11, line #1 ) [see chart below and available at Gradeinflation.com]. Grade curve calculator. For educators who haven’t the mathematical expertise or time to grade on the curve or grade to the median fairly, a grade curve calculator is available on the web. What is the connection to fraud? In analyzing the data sets, they could readily identify data (scores) that were outside of the expected range of performance. The investigators concluded that there were “huge disparities between the students’ continuous grades and their baccalaureate results and regional grades.” (para 3, line 1). So while some inflate grades to increase student self esteem (lowering student real competitiveness and increasing demands of entitlement), here and abroad institutions are fraudulently manipulating standardized test scores (to increase student fake competitiveness). Go figure. I guess it shows, you can never game the system as there will always exist (either in nature or man-induced), a countervailing phenomenon. G. Cizek and J. Wollack, Handbook of Quantitative Methods for Detecting Cheating on Tests, Taylor & Francis, 2016, 444 pgs.